A light breakfast is essential to kick-start the digestion and provide energy necessary to get through the activity of the day. If you wait until lunch to eat a proper meal, chances are you'll be tempted to wade into that packet of potato chips or get a doughnut some time during the morning. Have a stewed apple or pear, and then follow 30 minutes later with some warm cereal or a whole-wheat flatbread spread with a little honey or almond butter. Warm cooked foods are preferred as breakfast items over cold cereal, cold milk and cold juice, all of which are harder on the waking digestive fire. For a mid-morning snack, choose fresh fruit - an apple for Kapha, a sweet pear for Pitta and a mango or some strawberries for Vata. Fruit is best eaten in the morning, and on its own. 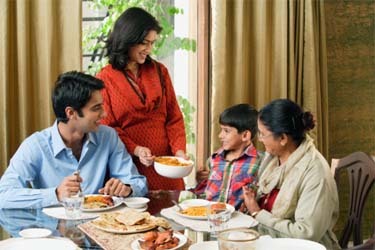 The ideal Ayurvedic lunch includes two or three kinds of vegetables, one of which should be a leafy green; a lentil or bean dish or a paneer dish; a whole grain; a chutney or relish; a small helping of a warm salad or soup; and lassi, a beverage made by blending together fresh yogurt and water. All of the dishes should be cooked with dosha-appropriate spices, and using a dosha-appropriate healthy fat - ghee for Vata and Pitta and olive oil for Kapha are good choices. This may seem like a huge meal, but portions can be kept small to moderate - the variety is crucial for wholesome, balanced nutrition. For dinner eat a small, light meal - a one-dish vegetable/grain casserole or a vegetable/lentil soup with a whole-wheat flatbread, for example. When your digestion is 'trained' to kick in at those set times through regular practice, it functions efficiently to build more ojas from the foods you eat. Ojas is the most refined product of the digestive process - the biochemical essence that sustains life and health. Nutrients from the foods you eat are absorbed and assimilated to the maximum extent by your body, and wastes are flushed out effectively, leaving little room for ama -- digestive toxins -- to build up in the body and act as a breeding-ground for imbalances and disorders. Everything is connected. For the food to eat to become ojas, you have to prepare it with attention, a positive attitude, caring and love. Many traditions hold the acts of cooking and eating sacred. In the Vedic tradition, the chef bathes and offers thanks to agni - fire - before beginning the task of preparing the first meal of the day for the family. Do not prepare meals (or eat) when you are upset or stressed, because your liver and digestion are adversely affected by negative emotions and will not digest that meal efficiently. Eat in the area or room designated for eating in your home or place of work, not in front of the television or at your workstation. Diffuse a pleasant aroma blend in your dining area about an hour before you will begin eating lemon, coriander, sweet orange and mint are good choices to whet the appetite and get the digestive juices flowing. Dress up your dining table with fresh flowers or a pretty tablecloth. Make sure everything you need for your meal is at hand before you sit to eat so you do not have to get up or be distracted from your meal once you start eating. Ours is, sadly, an on-the-run, 24/7, get-everything-done-yesterday world. Extending multi-tasking to eating is one often-seen habit that probably causes many health problems that could be avoided if one only took the time to accord the meal the attention it deserves. The time that is perceived as lost by doing nothing but eating can more than likely be made up in increased energy and productivity the relished, well-digested meal returns to you. Eating in silence, with all your senses focused on the aromas, flavors, colors and textures on your plate is best, with muted, pleasantly relaxing conversation or soft music in the background a second-best option. Arguments, highly stimulating discussions and disciplining children are activities not suited to mealtimes. Do not work or speak on the telephone when you eat. Do not read or watch television. Do not gulp down your food; savor each mouthful and chew well before you swallow. A few sips of warm water during the meal will help digestion, but do not drink too much of any beverage.